Yesterday, we finished the entire alphabet prompts and today is the last of the daily challenges which have been running for an entire month at Beccy's Place. Today we get to do "Anything We Love." I loved the Mistletoe which came in this set from Beccy's and had to use it before the challenges ended altogether. However, I wanted to try something other than just another card so I turned it into a tree ornament! plus Gold on the twine bow. I printed the mistletoe image onto CS twice, added glitter to the mistletoe berries, then after it dried, cut both of them at the same time with a die from QuicKutz. I wanted the ornament to have a bit of weight so I cut six more of the same shape from white CS. I sandwiched those six pieces between the two image pieces and glued them all together, adding the ribbon hanger to the center of the layers. If I do another one I think, instead of gluing the layers, I'll try weaving narrow ribbon through the holes and I can tie the ends together to make the hanger. 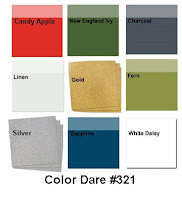 It'll make it a bit more decorative and I could even add a splash of bright color simply by choosing the right ribbon. Another Friday and another "Anything Goes" challenge at QKR Stampede! 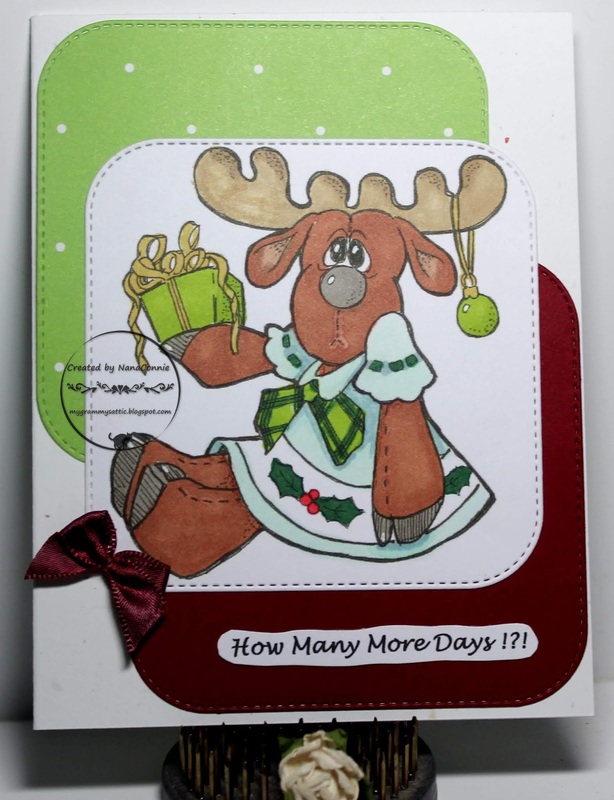 When I was looking through the Christmas images available from QKR, I found this sweet little she-moose. Her expression said she'd just found out Christmas is tomorrow and she only has one present ready. lol The image is called "Christmas Moose" and I just love her. Everything on this card came from scraps, including the white CS on which the image is printed. I colored with ProMarkers, added a few tiny highlights with a gel pen, and then used a stitched die from Cottage Cutz to cut out the image. 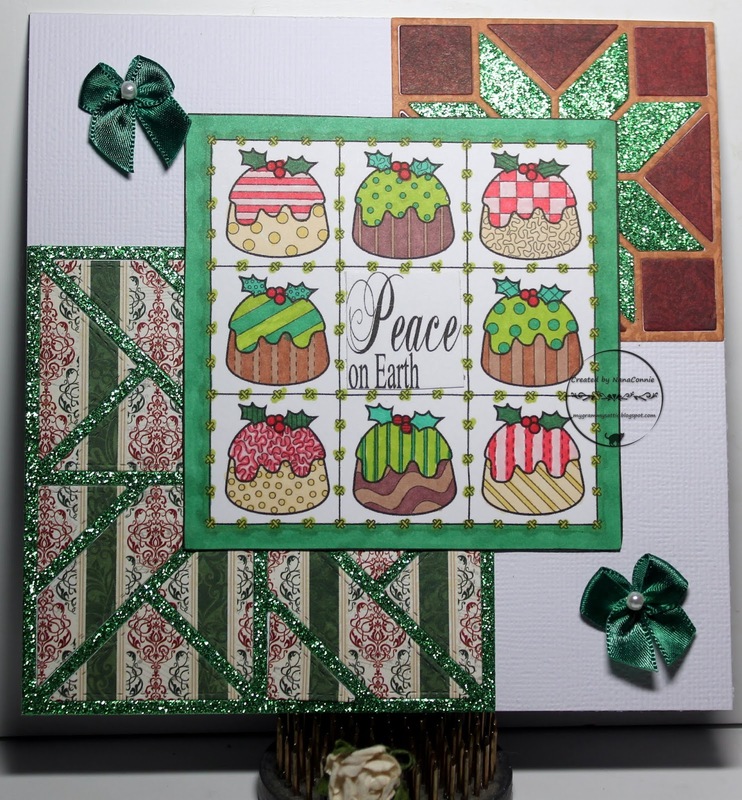 I used that same die on two dp scraps which I used behind the image piece. I sewed a tiny bow from a scrap of white ribbon, dyed it with a marker, and added it at the bottom corner of the image. Finally, I printed the sentiment, hand cut it, and layered it onto the burgundy dp. I started with the colors offered at My Favorite Things. I used ProMarkers to color, then cut the image and the sentiment with stitched dies from CUTplorations. The red mat is also cut with another die from that same set. I did the Z-fold on a slant, cutting off the top, right-hand, corner of the card front all the way to the middle fold before adding the image piece. I found some lovely silver ribbon, dotted with glittery snowflakes, and I wrapped it around the card front, behind the image piece. I also added a glittered snowflake. Two days left in the 30 Days of Christmas at Beccy's Place and the prompt today is the letter "Y." 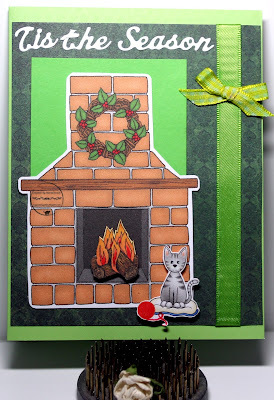 I decided on a salute to the tradition of the Yule log (see Yule Log history HERE) and used the Hearth set from Beccy's Place. This set is so versatile, having a wide variety of add-ons which can be used with the central fireplace. 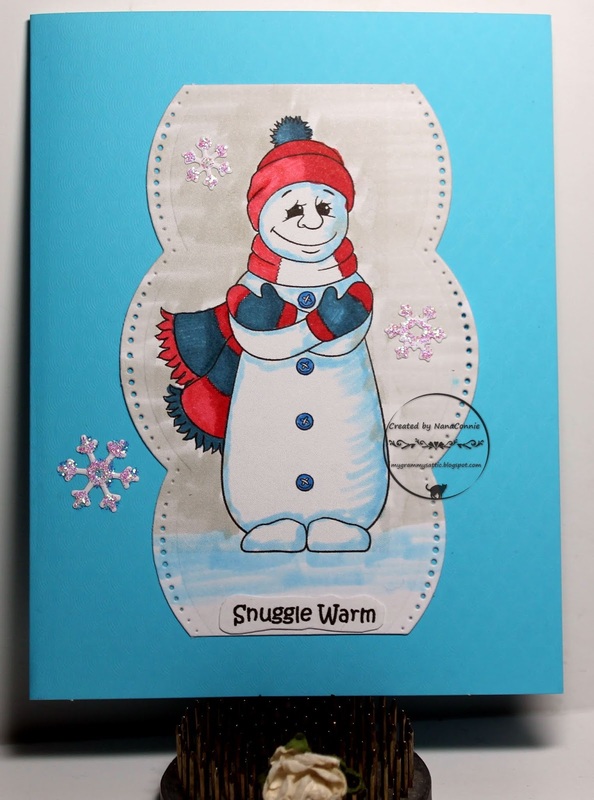 It can be used for cards throughout the fall and winter seasons. This is a pre-colored image, printed and fussy cut with scissors. The Yule log and flames are printed and hand-cut separately, then mounted on dimensional tape so that it stands out from the fireplace interior. The cat and his ball of yarn are also separate, fussy cut, and mounted on dimensional dots. The dark green dp serves as the wallpaper in the room, and everything is mounted onto a green card base. I used green satin ribbon from Crafty Ribbons and hand tied a bow made from plaid ribbon. I didn't add a lot of embellishment beyond the ribbon and bow because I really wanted to maintain the feel of being inside a room, next to the fireplace. The sentiment was cut with a die from Die-Versions. OK, we've reached the most impossible day for alphabet prompts - the dreaded "X" !! Last year I did a card with "X Marks the Spot" but this year, I borrowed (CASEd?) an idea done by Donna at Popsicle Toes last year, Xs and Os. What could be better than snuggling up for hugs and kisses at Christmas - with or without mistletoe? The darling penguins are from Beccy's Place, appropriate for the 30 Days of Christmas daily challenges which have been going on there all month long. flipping it side to side. I started with a pre-colored image, then used ProMarkers and white gel pen to add the shading and highlights. The XOXOs and the sentiment were printed as part of the image. The image piece was cut with a die from QuicKutz and matted with a square of green CS. The plaid dp was a scrap as was the blue CS. Everything was mounted onto a kraft card base. I added the little snowflakes for sparkly embellishments. 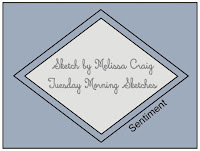 A new alphabet prompt at Beccy's Place today. "W" is a little bit easier than U and V were but I did try to get creative with the Wreath so that it wasn't ordinary or expected. turning it a 1/4 turn and offsetting the middle band. I chose a piece of deep red CS, ran it through my "Linen" embossing folder, and Wrapped it with Wide, Wired ribbon. I added the image on top of that, then printed the "Wishing you...." sentiment. I wanted something as a focal point in the center of the Wreath so I cut a snowflake with a die from Art Impressions and put a tiny gem on it. I added a handmade bow and called it finished. These last few alphabet letters really take some thinking but Beccy (30 Days of Holidays at Beccy's Place) does give us some great hints. Going to her list for "V" inspirations, I chose Vintage, Vermilion, Violet, and Verdigris, then added Vine on my own because of the image I chose to use. It's the "7 Swans a Swimming" image from Beccy's 12 Days of Christmas set, one I don't think I've used before. Of course, that song is now in my head for the rest of the day! I colored with ProMarkers, then fussy cut the image. 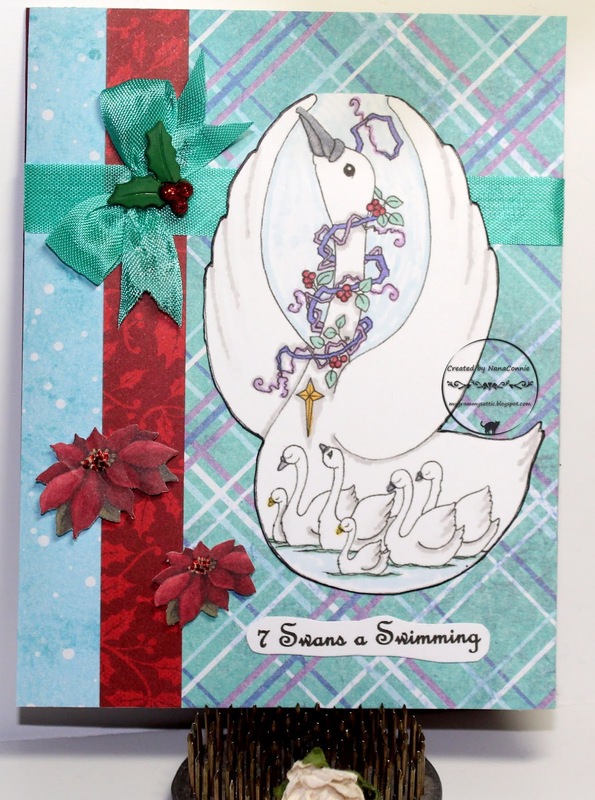 The coloring on the Vine round the swan's elegant neck is done with Violet (as is one of the tiny stripes in the plaid paper), Verdigris leaves, and Vermilion berries. The dp, plus the ribbon and hand-tied bow, are Verdigris and the Vertical strip of dp is Vermilion. I used a holly shank button on the bow (cutting off the shank before I applied it.) The two poinsettia flowers are adhered with Pop Dots, giving some wonderful dimension. This year, I'm doing some Very special cards which will also be my gifts to those friends and this is one of them. I have a friend who moved to Arizona last winter and she has collected swan figures and pictures for many years now. I know she'll love this card! 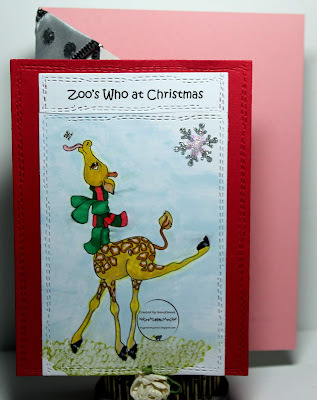 The letter "U" is the prompt for today over at Beccy's Place 30 Days of Christmas cards and it's not an easy one! I decided on one of the suggestions given to us by Beccy ("Under the Tree") and went looking for a Beccy's image I could reasonably put Under a tree. the My Favorite Things challenge. 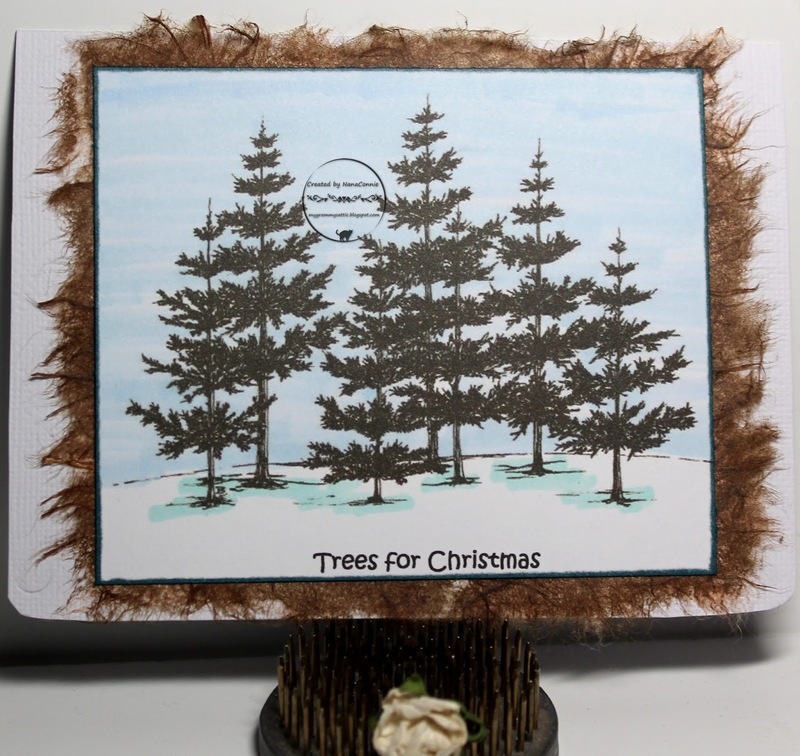 The tree is one of Beccy's Images and I colored the scene with ProMarkers, adding snow to the tree with white gel pen. The presents were also colored with ProMarkers but they came from another of Beccy's sets, the one I used for my "Reindeer in Training" card a few days ago. I printed it twice, reversing the image once, and making sure that the image was printed small enough that the gifts would fit Under the tree. That's one of the great things about using digis - you can adjust the size to fit your needs! I cut the reindeer away from both images, leaving only the stack of presents. then cut off the sled on one of them, doing fussy cutting on each one. That was a dedicated effort because those piles of packages are less than a square inch in size. 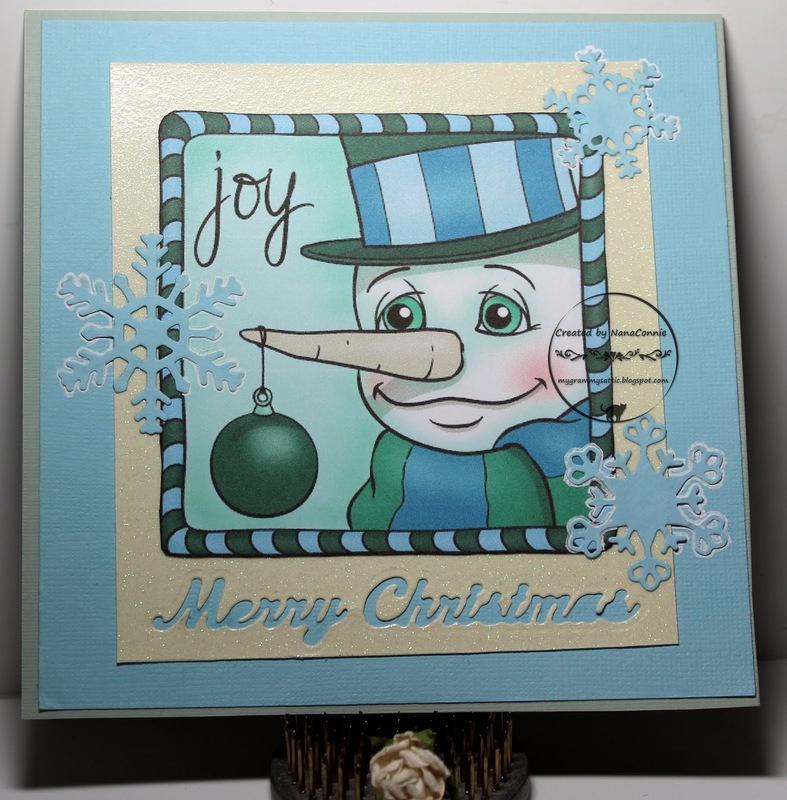 Once the presents were adhered, I cut the entire image piece with a Spellbinders die and backed it with CS. The stitched ribbon is from Crafty Ribbons and the snowflake is covered in glitter. Here's my post for the 'curve' Beccy's Place threw us on Thursday when she gave us a prompt of "CASE Yourself" instead of the letter "T" which I was expecting and had prepared ahead. 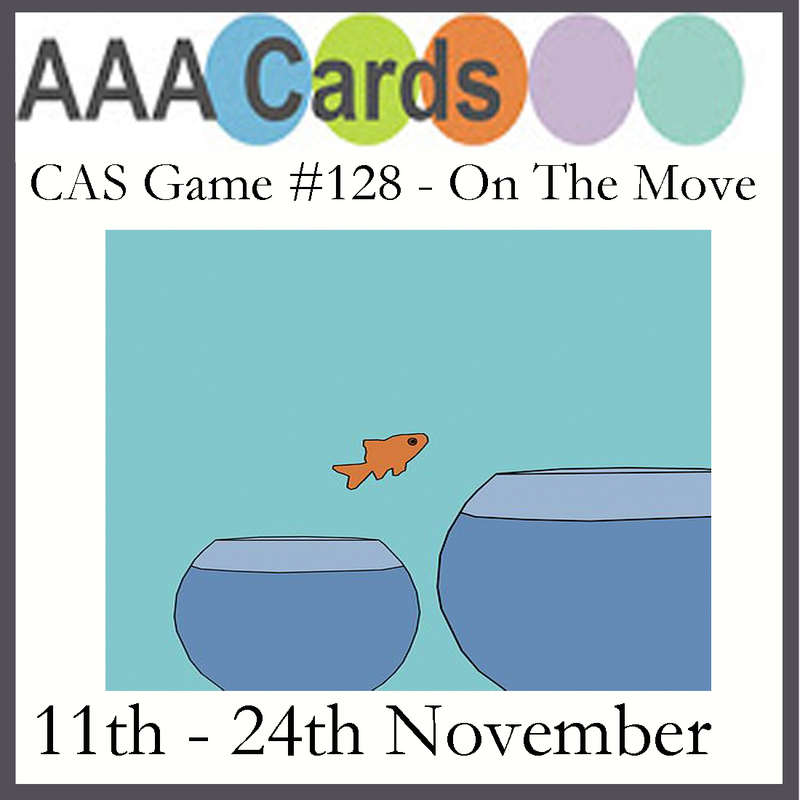 We have to take a previous card we have made and CASE it. 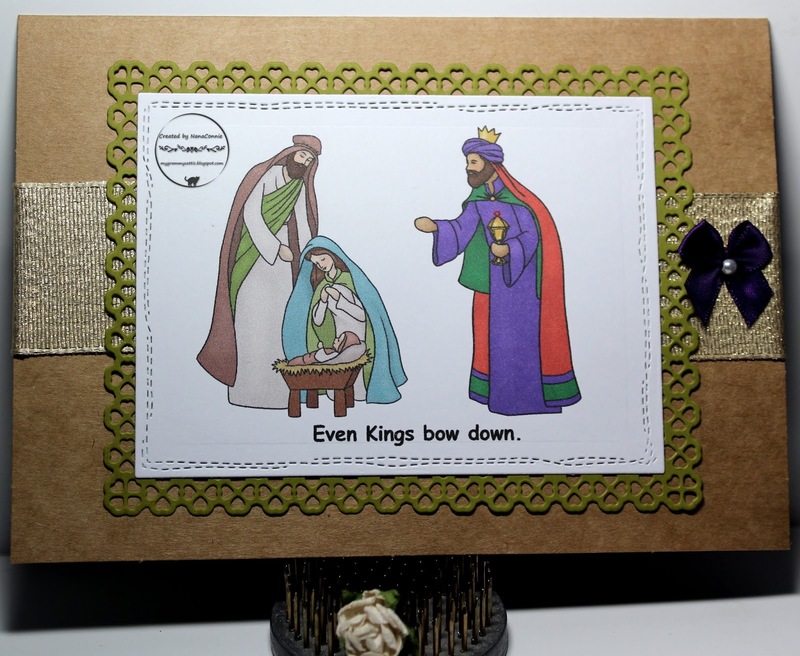 Here's the card I CASEd, one I did last year for the 30 Days of Christmas. You can see the post HERE. I used one of Beccy's freebies. a pre-colored version of one of her new Nutcrackers. I decided to reverse the reds and greens from last year's card while still keeping the single character as the main focus. I punched the corners of the image with another Fiskars corner punch, and began searching through my Christmas ribbons. I was looking for that same plaid ribbon but it was not to be found. 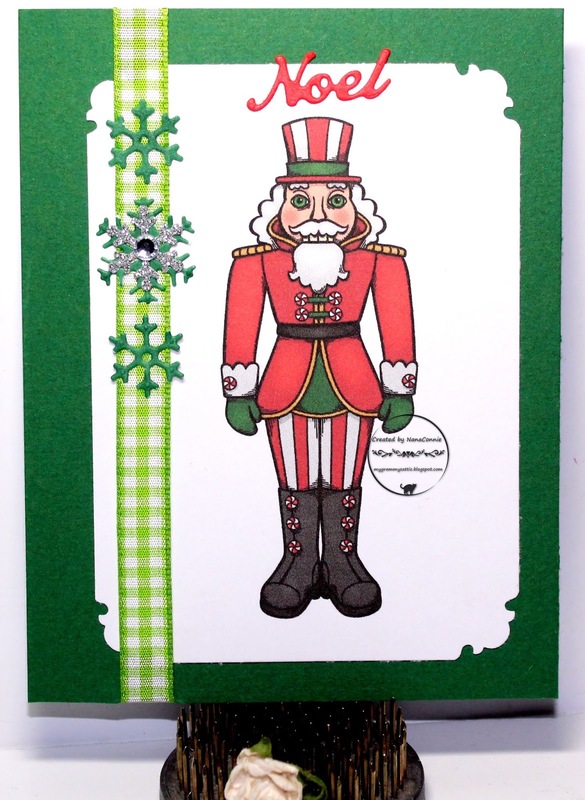 I really love the one I did find and I think it goes well with the masculine Nutcracker image. I used an Art Impressions die to cut the snowflakes, made the center one with 2 layers, and added glitter and a gem to the top snowflake. The sentiment was cut with a Die-Versions die and it echos the sentiment from last year. This delightful "Christmas Snowman q-24346" image from QKR Stampede is perfect for this time of year. 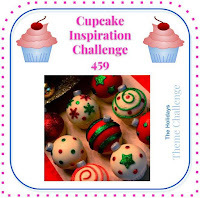 Our latest challenge starts today and our theme is always Anything Goes. I colored with ProMarkers, then cut the image with one of my earliest dies from Spellbinders. I printed and hand cut the sentiment before mounting everything onto sea foam green CS. I wrapped it with sparkly, white and gold, wired ribbon and added one of my signature bows, hand-sewn with a pearl and dyed with a ProMarker. Edited to add: Beccy's Place threw me a curve giving us a non-alphabet letter prompt for today but I'd worked ahead on and pre-scheduled my "T" card since it's Thanksgiving and I won't be posting until I'm back home. I'll get caught up as soon as I can. One more post with a card for the 30 Days of Holiday cards at Beccy's Place and the prompt is "T." Trees is a pretty obvious choice but I chose this image from Beccy's with pine Trees in the forest instead of a decorated Tree in the house. which I found at House that Stamps Built. I used ProMarkers to color the image, then cut it with a simple, rectangle die from Tonic Studios. I added Teal ink to the edges of the cut piece. The mulberry paper is called Teak Brown. The Trees have a Tapered shape, adding yet another T ! Two posts today but none tomorrow because of Thanksgiving when I'll be visiting with family for the holiday. This post is for the "S" prompt at Beccy's Place 30 Days of Holiday cards. I am just crazy about Snowmen, especially those I find at Beccy's, and this is one of my favorites. 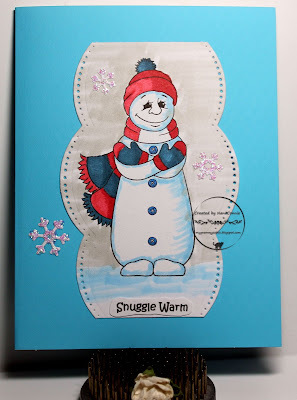 I colored with ProMarkers, using Scarlett and Deep Sea Blue as my primary colors, then cut the Snuggly Snowman with a Scalloped border die from Spellbinders. I decided on a very Simple design so I adhered the image to a card base, then cut 3 Snowflakes with a die from AI. Two of those are not obvious since they are in the Sky next to the Snowman. I added Sparkle to the snowflakes and called it finished! 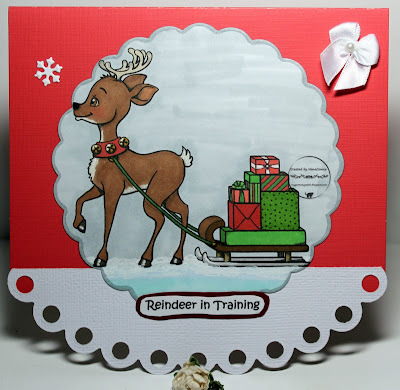 You may not be aware that Santa has to train new reindeer for a very long time before they can become the next Dancer or Prancer. Since we're doing "R" as a prompt at Beccy's Place today, I decided on one of her Reindeer images. Doesn't he look like he's training to pull a full sleigh one day? I thought it would be fun to do a Rocker card since I haven't done one in at least a year! The Rocker part is cut with a QuicKutz die. 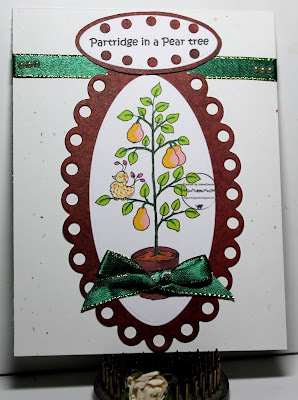 I colored with ProMarkers and cut the image with a Sizzix scalloped die. 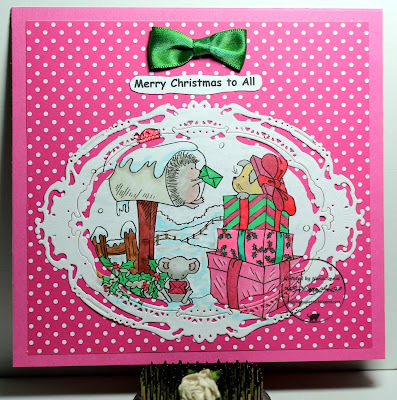 I used Red CS for the upper part of the card and layered the image circle onto it and the Rocker. 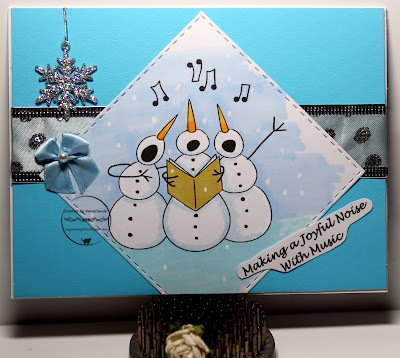 I added one tiny snowflake (AI die) onto the card as embellishment and used one of my hand-sewn, satin Ribbon bows (left white this time) to use in the other corner. I printed the sentiment, hand cut it and matted it with deep Rust CS, then hand cut that, also, before adding it at the bottom of the image. This is an unexpected second post today but I want to share a warm and wonderful story, and the card which resulted from it. A few hours later, it arrived in my mailbox with a note that it had been sent to me by my Secret Santa! Somebody at the Outlawz has the most generous heart in the world! Thank you, Secret Santa. You are truly blessed. 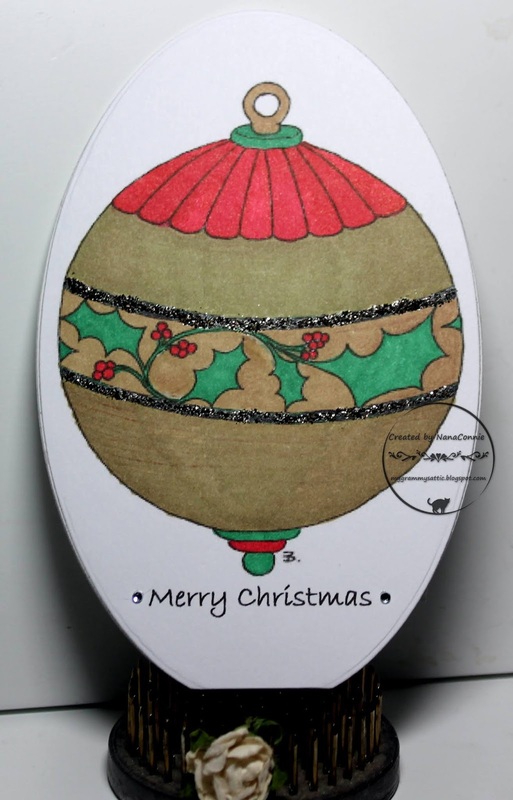 I colored with ProMarkers and cut the image with a Sizzix scalloped die. The frame was cut with a die from QuicKutz. I layered those together and went looking for ribbon. 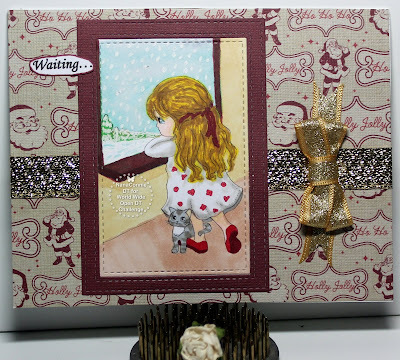 I found that gorgeous, sparkly gold, wide ribbon in my Christmas stash and wrapped it around the card front, adding the image piece on top of it. 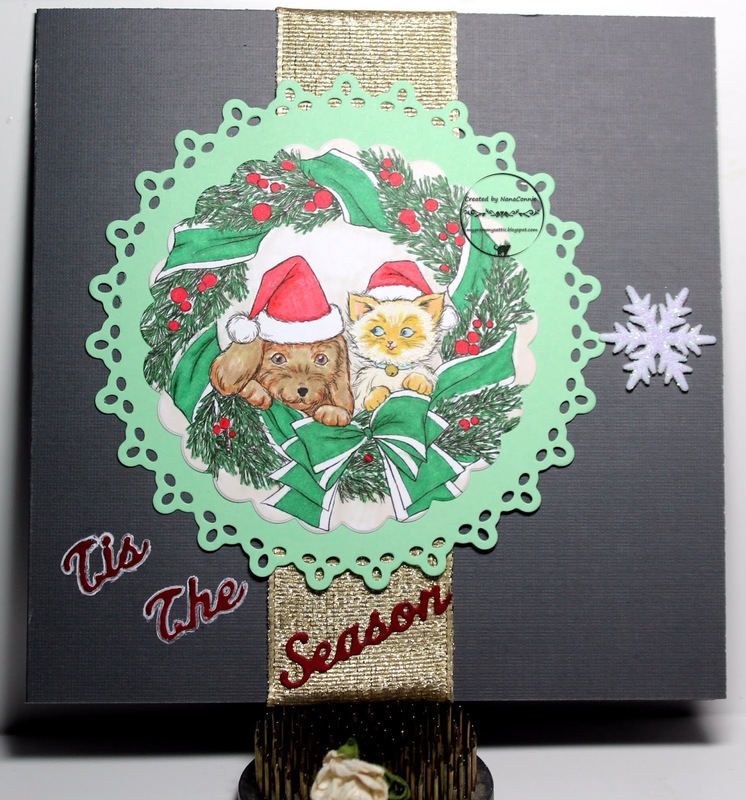 The sentiment was cut with a Die-Versions die and I used a glue pen to adhere the words to the slate gray card front and the ribbon. I used a white gel pen to outline the two words on the gray CS. That made them pop. Before that, they were a bit hard to read. The final touch was the snowflake which is covered in glitter but that just doesn't show in the photo. I'm following the letter prompt of "Q" at Beccy's Place for the 30 Days of Holidays but I keep forgetting which letter it is because I have as many "P"s as "Q"s in today's post; maybe even more. :-D But I did "P" yesterday so this is all about the Christmas Pudding Quilt. I colored the Quilt image with my ProMarkers (my favorite method of coloring) and then replaced the center square with my wish for Peace on Earth - a sentiment which is also from Beccy's Place. I spent a bit of time sizing it to fit and still had to trim the edges in thin slices but it did fit eventually. 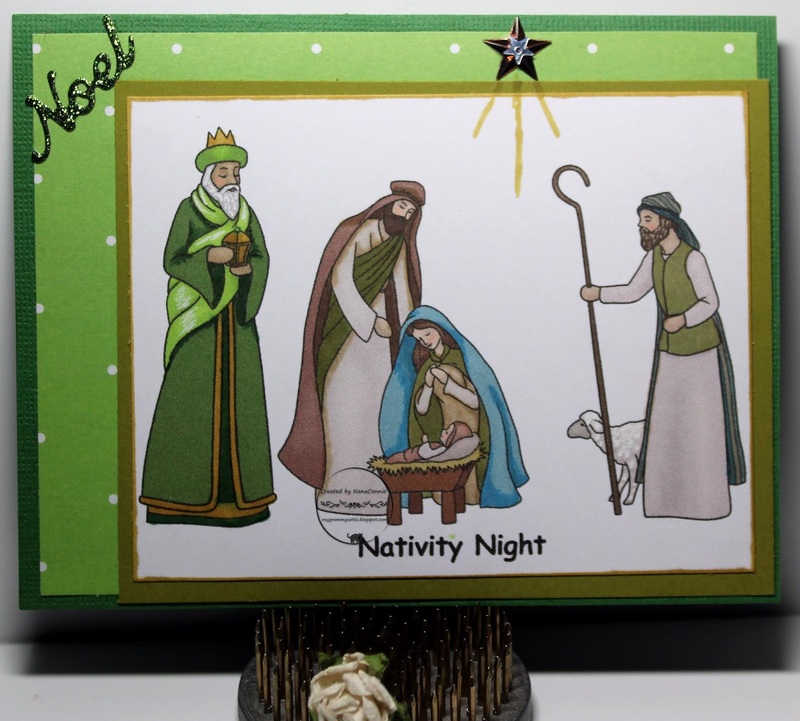 I used two of my Quilting dies - one from Gina Marie and one from Sizzix - to cut the dp and the glittered paper. I made that glittered paper by adding loose glitter to sticker paper, burnishing it in, and then cutting it with the die. I have to give my friend, Donna, credit for jogging my memory and inspiring me to use that technique again. Here's her post about glittering sticker paper, but I didn't do anything nearly as complex as she did. I just peeled off one side of the sticker paper (trimmed to the size I needed for the die), added glitter to the entire thing, then cut it with the quilt die. It made the glittery pieces easy to apply since they already had adhesive on the backs. I put the Quilted papers together like a puzzle, then placed them into position on the card front. The Christmas Pudding Quilt image went on top. I embellished the corners with two of my signature bows which had been dyed with a Pine ProMarker. 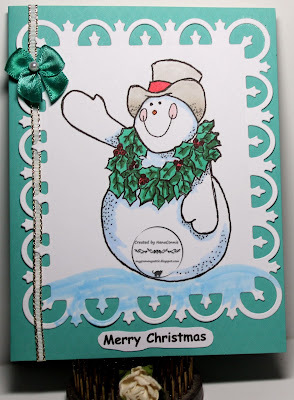 Yep, you guessed it - we're doing the letter "P" in the 30 Days of Christmas cards at Beccy's Place today. 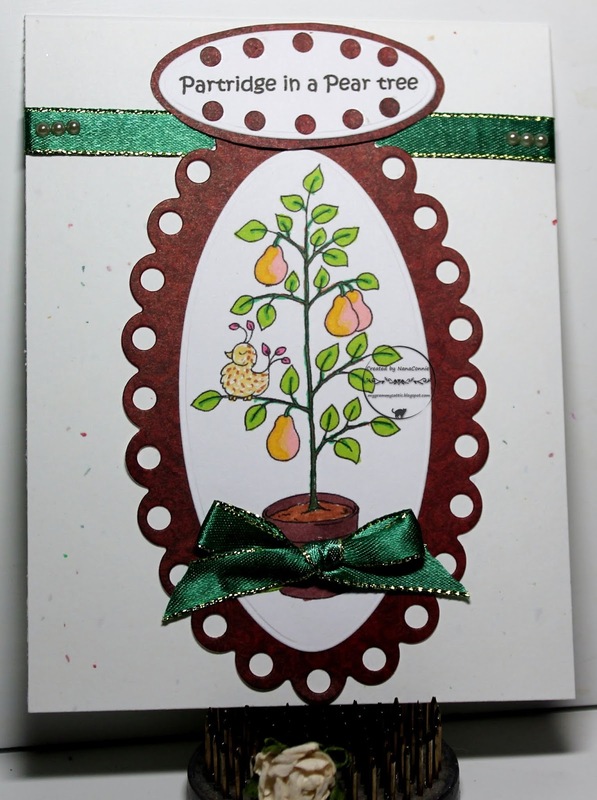 I've used Beccy's Partridge in a Pear Tree image from her 12 Days of Christmas set. I've had this set for at least 4 Christmases and have used some portion of it each year. I think this image is my favorite. I used ProMarkers to color the image, including the Pears and the Partridge, giving her Pink tail feathers! I used Pine green ribbon for the strip at the top and added Pearls on each end. The same ribbon was used to tie the bow. The image and the scalloped frame were both cut with dies from QuicKutz. Before assembling the tent card, I tapped on a Paint brush to spatter Peach, Poppy and green watercolors on the card front. 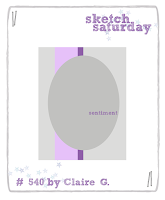 On the sentiment piece, I used dots which were Punched out of the the same CS I used for the frame piece. 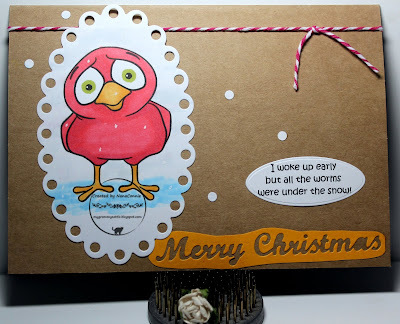 Today we're doing the letter "O" as the prompt at Beccy's Place for the 30 Days of Christmas cards. I found one of Beccy's fabulous Ornaments and used it. It colored up beautifully. Color combo came from My Favorite Things. I colored with ProMarkers, and the parts which look gold are actually colored with an Olive green marker. The two narrow stripes bordering the holly are done with Onyx glitter. 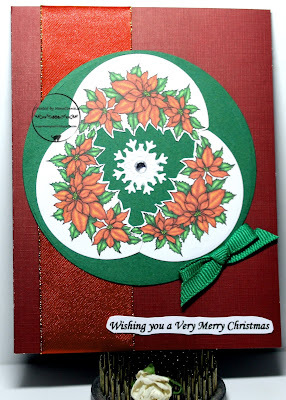 I had already decided on a shaped card so I dug out one of my Oval dies from QuicKutz and used it to cut the card shape. 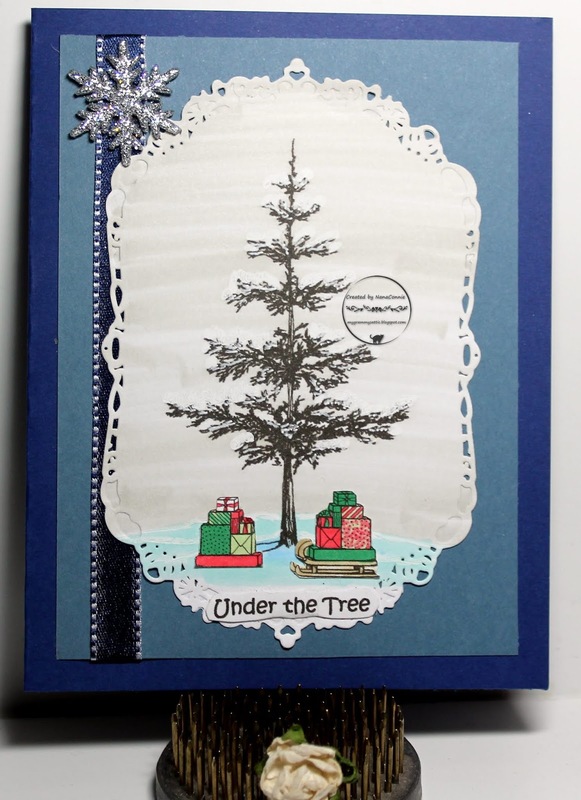 I had to plan ahead for this card because I wanted it to be a One layer card so I had to put the Ornament at the bottom of the CS sheet in order to have the fold at the top to make a tent card. This is my first ever Oval card but I'm liking it! I added two, teeny, rhinestones - one on each side of the sentiment. Good Friday Morning all of you! If it's Friday, it must be time for another QKR Stampede challenge. I want to share a card with you this morning which will explain why your Christmas packages may arrive late or even not at all. You can use the information to explain to all the kids and grandkids why there are no presents under the tree for them. only this time I did the diagonal bottom left to top right. I used ProMarkers to color the image, then cut it with a rectangle die (Spellbinders.) I inked the edges and cut a tiny, decorative corner (also Spellbinders) which is off -the-edge of the image piece. I used a Darice EF to emboss the scrap of distressed, red CS. I added grosgrain ribbon and a lace, bow-tie bow which I dyed red with a Copic marker. It didn't really need any more embellishment so I left it rather CAS. It's going to be a perfect masculine Christmas card. 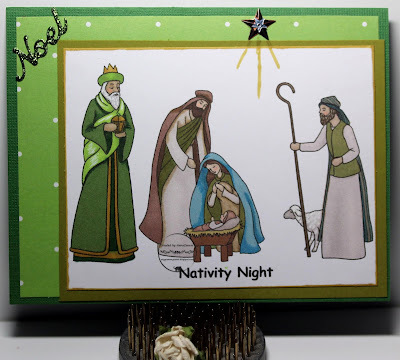 I love using Nativity scenes at Christmas - it reminds me of the Reason for the Season. I remember, as a child, being completely fascinated by a Nativity set my Grammy had. Her father had hand carved it from blocks of soap her mother made. She told me that when the set was new, it was sparkling white (a huge feat for home made soaps in those days) but by the time I was seeing it, it was yellowed with age. I thought that made it all the more spectacular. :-D It was passed on to my mother but I have no idea what became of it after that. If it was still around, I'd be setting it out each Christmas. 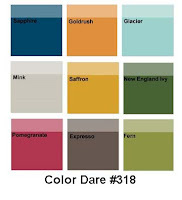 3rd column plus Saffron for the gold shades and neutrals of beige & brown. Once again, I started with a pre-colored image (printed with the Nativity Night sentiment) but I used ProMarkers to add highlights and even to change some colors on the clothing. I used white gel pen on the lamb and on the beards of the shepherd and wise man. I cut the image with a rectangle die from QuicKutz, inked the edges with gold ProMarker, and matted it with Natural Earth CS - CS which is made completely from recycled products. I layered additional papers behind the image onto the card front, all of which were scraps left on the crafting desk. I swear, most of the time the only way the craft desk gets cleared off is because I'm using up things left over from other projects! I dug through my bag of spangles and sequins to find the two stars, one gold and one silver. I layered those together with craft glue (not easy to do with things that tiny) and added them above the image. I used the gold ProMarker to draw the lines of light downward. 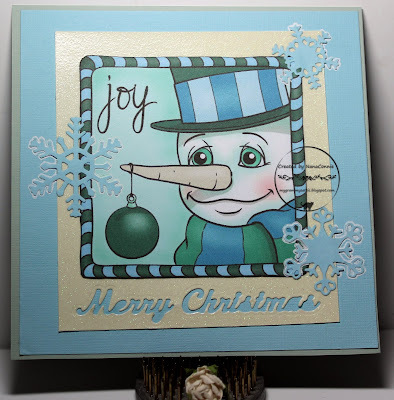 Finally, I found my Noel sentiment die (by Die-versions) and cut white CS, then added Neptune Green glitter to it. Once that dried, I put it on the upper corner and called the card finished. It's the 15th of the month so it's time for the next challenge at Creations in Pink. 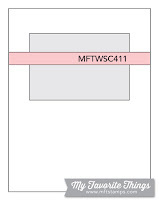 Our theme is always "Anything Goes" as long as you use lots of pink in making your creation. 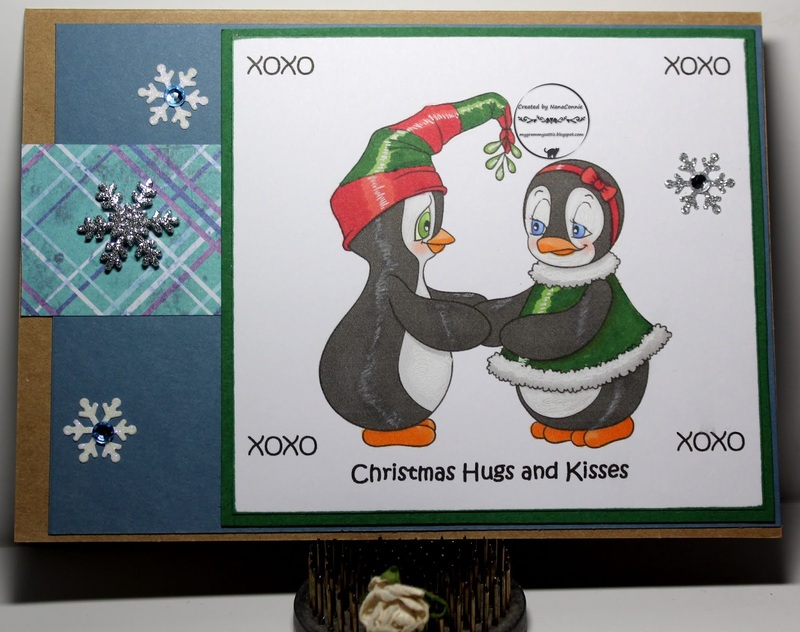 We have wonderful sponsors this month; Starz Stamps and Di's Digi Designs. 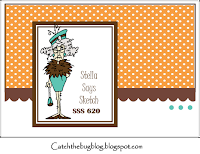 I'm using a darling image from Di's Digi Designs, called "Surprise for All" (which may have been retired since I can't find it in the shop.) I chose this one from my own, rather large, collection of Di's stamps. I colored the image with ProMarkers, then cut it with two related dies from Spellbinders and I inlaid the die cuts into each other. I mounted that piece onto pink polka dot paper. I printed the sentiment, hand cut it, and added it above the image. I used green satin ribbon to tie a bow-tie bow and put it at the top. Everything went onto a pink card base. I started with the sketch from Tuesday Morning. I colored with ProMarkers, my favorite alcohol Markers, and cut the image with a Lawn Fawn, stitched, square die, turned on point to make a diamond shape. The silver and white ribbon is wired & glittered and I wrapped the card front with it. I printed and hand-cut the sentiment and began layering on all the different bits and pieces. The bow is from my stash, one of those I make by the dozens and toss into the stash for future use. The snowflake charm was in my Christmas stash and I'm sure it's been there for 3 years, forgotten and unused. It seemed awfully happy to see the light of day when I took it out. :-D I added glitter to it and put it in a prominent place at the top of the card. 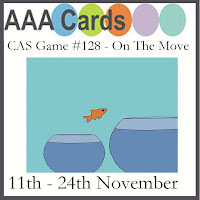 It's time for the next monthly challenge at World Wide Open Design Team and, as usual, we have an Anything Goes theme. I used this sweet image from Julia Spiri called "Little Lori." It wasn't designed to be a winter or Christmas image, but I used gel inks to add the snow and it made a perfect Christmas Eve image. Can't you just feel Little Lori missing all those who are due to come for Christmas? and moved the vertical bow off the image to the side. I colored with ProMarkers, then used dies from Art Impressions to cut both the image and the frame. I chose a pre-made card base from DCWV and the "Holly Jolly" design is printed right onto the card front. I went through my stash of Christmas ribbons, found two that were gold and glittery, used one to wrap the card front and the other to tie a double loop, double layer bow with the help of my Bow It All. I printed and hand cut the sentiment. The alphabet prompt today at Beccy's Place is the letter "L" and I used one of Beccy's Seasonal Window images to make my card. This is the winter window and it gave me another chance to focus on being home for the holidays - Thanksgiving or Christmas. 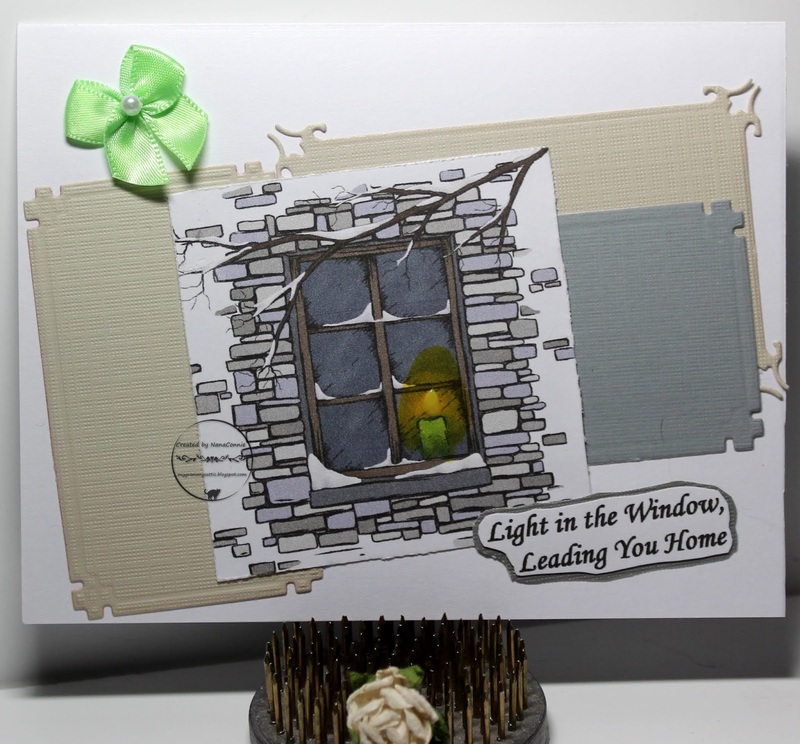 I played with a pre-colored image but used a Lemon ProMarker to cast the glow on the window pane and a pale green to color the candle. I also used a couple of gray ProMarkers to enhance the bricks a bit, and used a white gel pen on the snow. I added Lemon yellow, Nuvo Crystal Drops to the flame which gave it both shine and texture. I know that's hard to see but if you click on the photo to enlarge it, you'll get a good look at it. The image piece was cut on my Fiskars paper cutter, then I distressed the edges. I cut scrap pieces of gray CS with a Bo Bunny die and made Layers with them, adding the image piece on top. I printed the sentiment, getting two more Ls, Light and Leading. The bow is one of those I sew up by the dozens using white ribbon, then I dye them the color I want with ProMarkers. The bow is the same color as the candle, and that complementary pop of color in the bow makes the candle more visible to the eye. 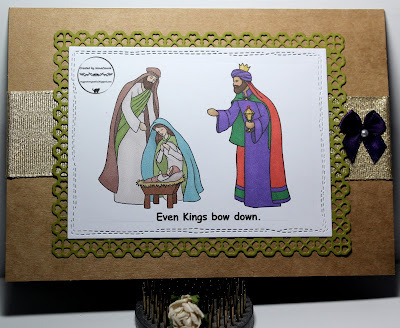 I'll bet the title of this post will tell you all you need to know about today's prompt at Beccy's Place in the 30 Days of Christmas cards. I actually combined Beccy's images to add the King to the nativity scene. 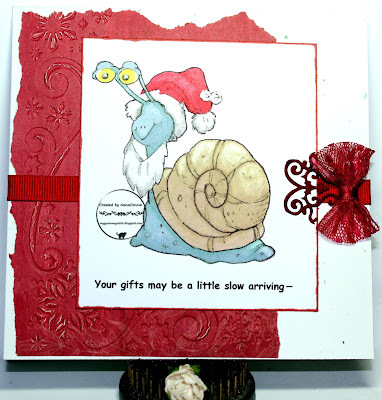 Really fast details: Image cut with stitched, CUTplorations die and Khaki green mat cut with Gina Marie die. Ribbon is wired and wrapped around card front, and the bow is one of my signature, hand-sewn, bows dyed purple with a marker. We're back to the alphabet prompts at Beccy's Place 30 Days of Holidays and today's letter is "J." What's better than the Joy of Christmas as shown by a Jolly snowman with an ornament hanging from his Jaunty nose? Color My Heart Color Dare. I colored with ProMarkers and I'm calling those greens "Jade, Juniper, or Jungle" to add a few more "J"s. Don't they look great against the glacier blues? I cut the image with a simple, square die from Spellbinders, then used another larger die from that set to cut glittered, white CS for the frame behind it. 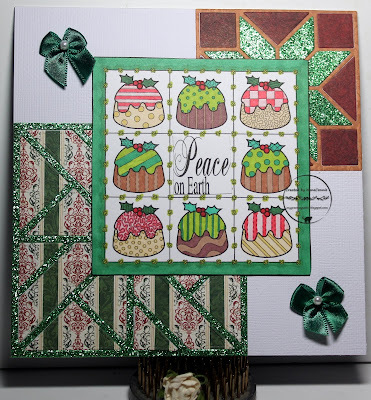 I had already used an Elizabeth Craft Designs sentiment die to cut out the "Merry Christmas" which I used on another project. The snowflakes were all cut with various Spellbinders dies. I used white gel ink to pop them from the blue background, adding some dimension at the same time. a better fit for this little lady. I colored with ProMarkers and die cut the image with a stitched die from Memory Box. The background papers are from DCWV. I sewed one of my favorite bows, dyed it royal blue, and added a glittery paper-punched bit to the center. Today the theme at Beccy's Place, where I'm playing in the 30 Days of Holiday cards, is a BINGO board. I've used the 3rd column: Ice & Snow/ Ovals/ Kraft CS. The little 'cardinal' (maybe he's an owl, but since I colored him red for Christmas, he's now a cardinal!) is one of Beccy's images and I did a take off on one of the sentiments that comes with this bird set. I colored with ProMarkers, then cut the image with an oval die from QuicKutz. The sentiment, "I woke up early but all the worms were under the snow!" was also cut with an oval die from QuicKutz. I used kraft CS for my card base.